My boys are heading back to school next week, so this week we are busy labelling school supplies and finding sneakers that fit everyone. 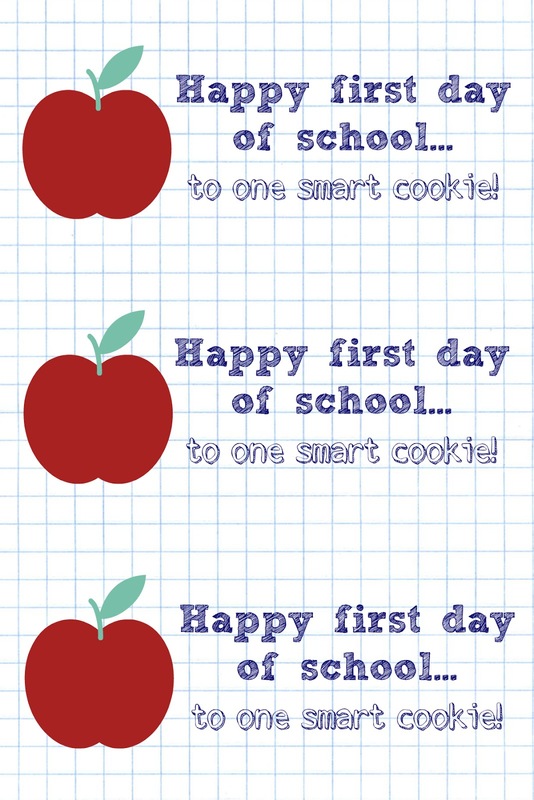 We are also putting together some treats to share with their classmates on the first day of school. Check out the adorable first day of school treats and sweet printable tags they will be handing out to their friends. Cute, right? 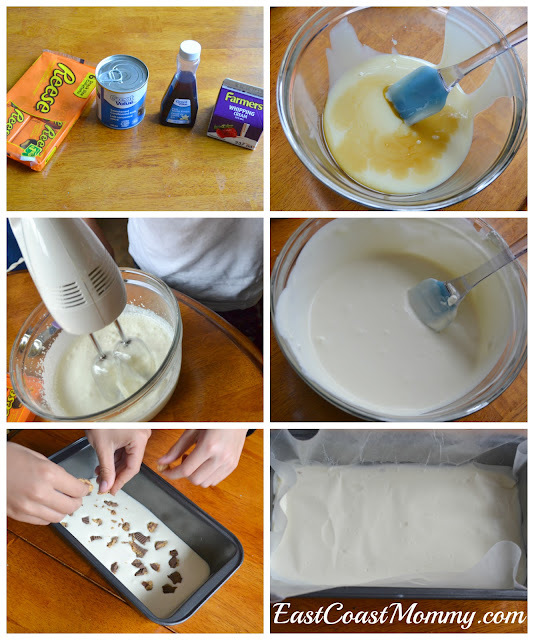 It's a simple idea, but it is a sweet and thoughtful treat. Each of my boys chose their favorite (peanut free) type of cookie, and I designed a tag to staple to the top of each bag. To download the tags I designed (for free): right-click on the picture below, save it to your computer, and print it like a regular 4X6 photo. Each print can be cut into three tags. Isn't taking a special treat on the first day of school a fun idea? And these first day of school class treats are super-easy and inexpensive to put together. No baking required! Today I am sharing three BUG themed crafts that are easy to make, totally adorable and perfect for Preschoolers (and older kids too). 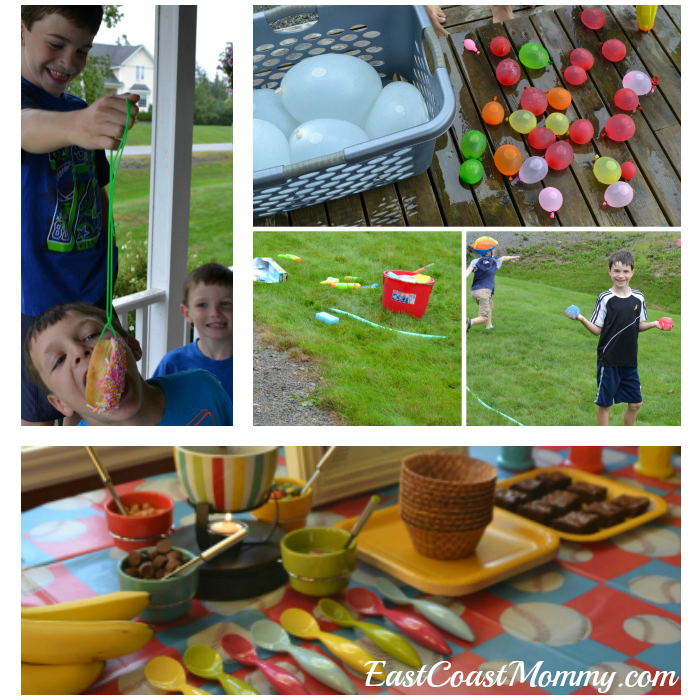 I love that they use a variety of simple supplies and a plethora of cheerful colors. 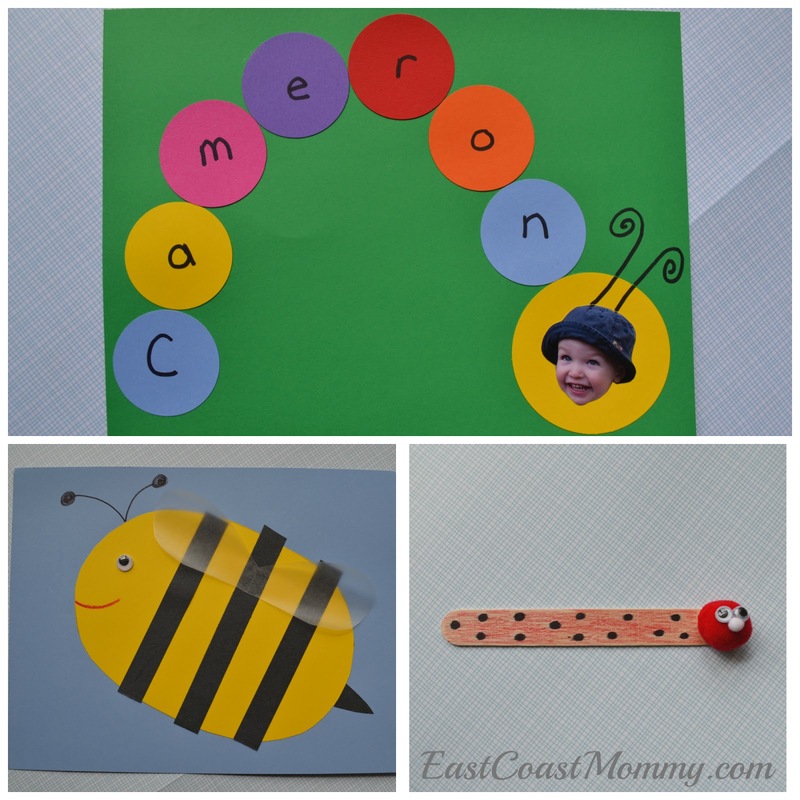 Below, you will find all the instructions you need to make: a colorful caterpillar, a beautiful bee, and a bookworm. 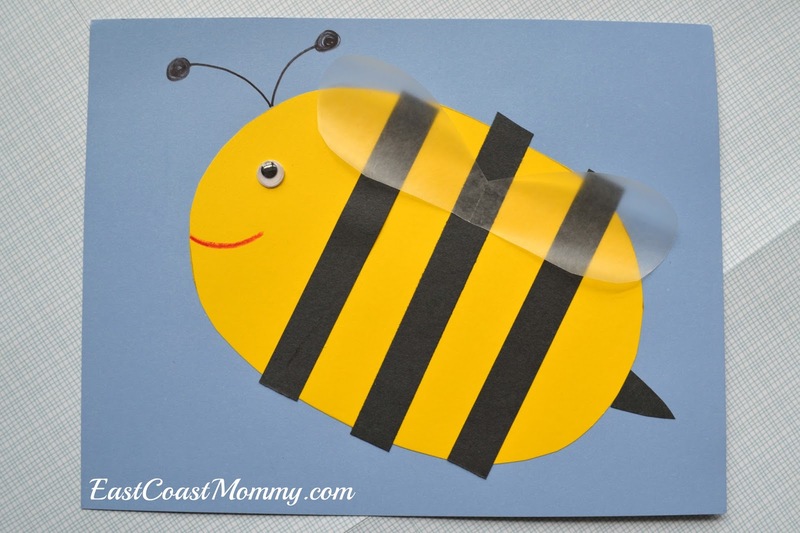 1) Cut an oval shape from a piece of yellow paper, and glue it to another piece of paper. 2) Cut stripes and a stinger from black paper, and glue to the body of the bee. 3) Add a googly eye and wax paper wings. 4) Use a crayon to add antennae and a mouth. 1) Use a glue gun to attach a pom pom to the end of a craft stick. 2) Glue on googly eyes and a small pom pom. 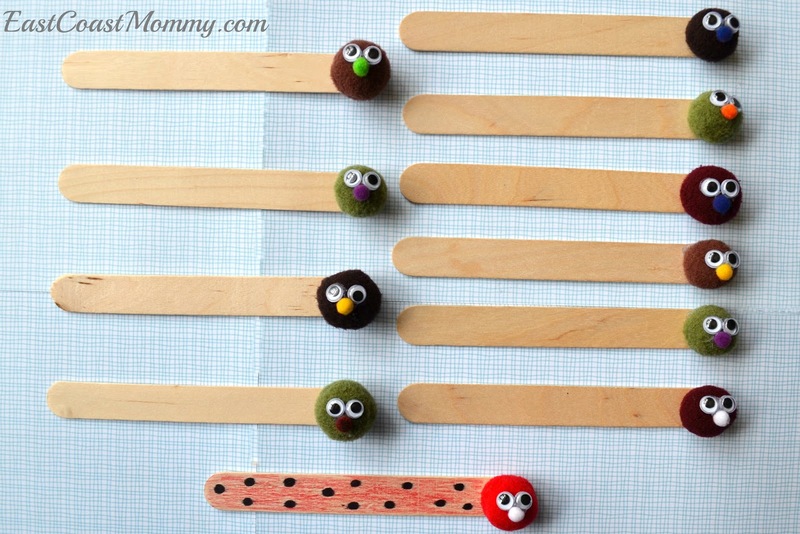 3) Use markers and crayons to decorate the craft stick. 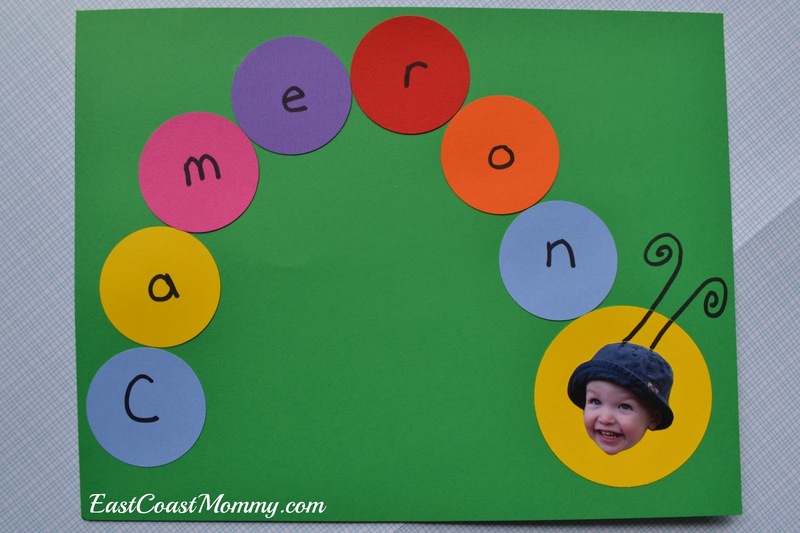 1) Cut circles for every letter of the child's name and one for the head. 2) Write the letters of the child's name on the circle. 3) Glue all the pieces in place (including a picture of the child). 4) Embellish with markers or crayons. Cute, right? Do you have a favorite? I think all three of these bug crafts are absolutely adorable, and they give children the chance to play with glue, scissors, and crayons. 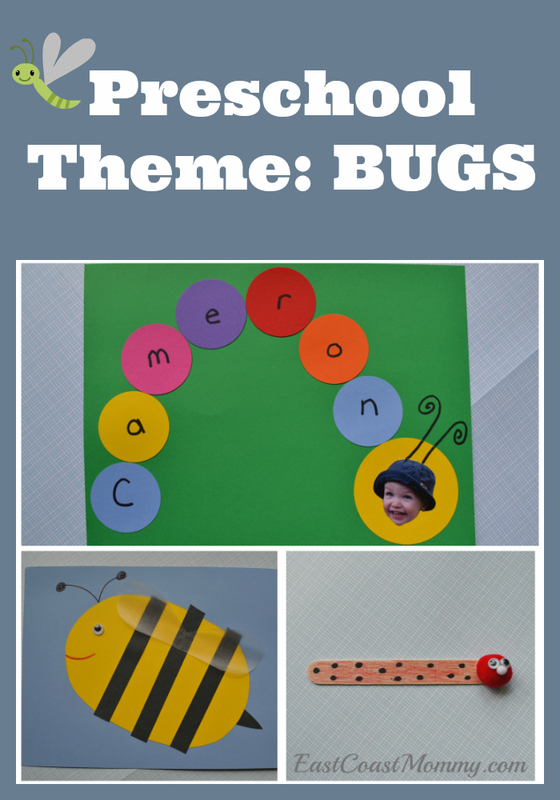 Which of these "bug" crafts will you make first? 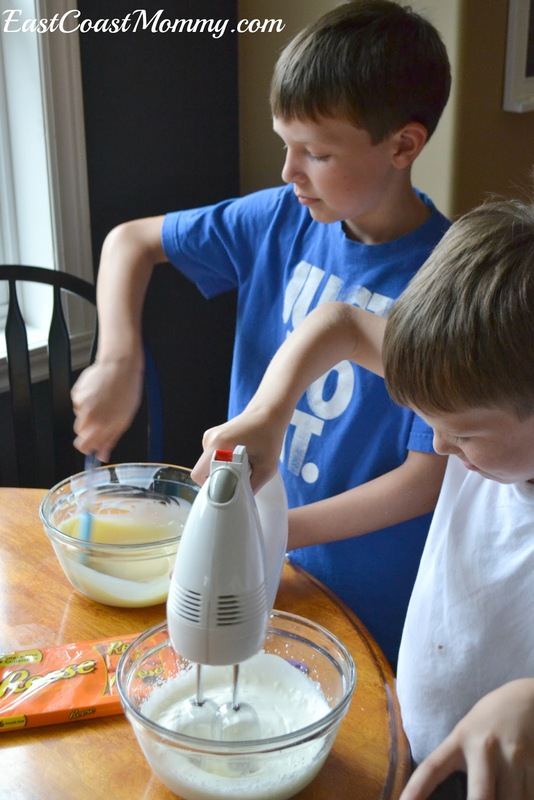 I love cooking with my boys, so I thought it would be a lot of fun to make homemade ice cream with them this summer. I have seen many "no churn" recipes on Pinterest that use cream and sweetened condensed milk, so I decided to experiment with creating our my version. 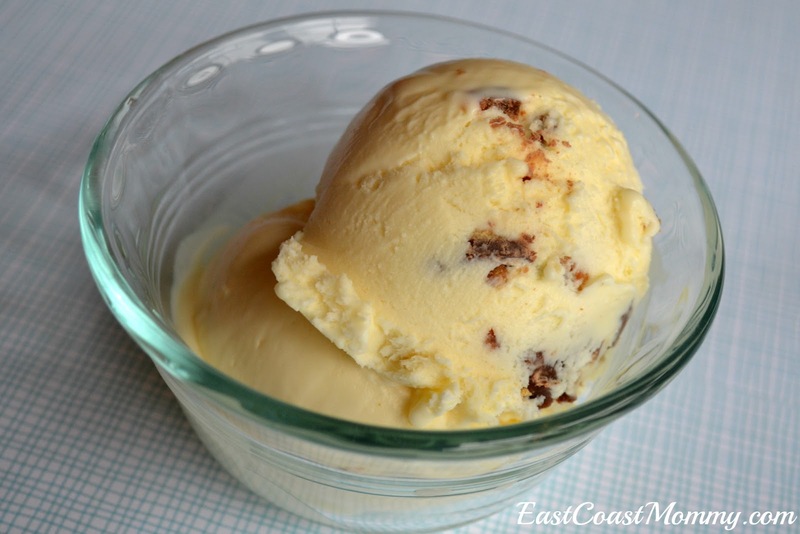 Today I am sharing our SIMPLE recipe for Reese's Peanut Butter Cup No-Churn Ice Cream. 1) Empty the can of condensed milk into a large bowl, and mix in the vanilla. 2) Use a hand mixer to whip the cream (for approximately 3 minutes). 3) Gradually fold the whip cream into the condensed milk (just until combined). It starts out lumpy, but if you keep mixing, it will get smooth. 4) Pour half of the mixture into a loaf pan, sprinkle the chocolate on top, and add the remaining mixture. Use a knife to swirl in the chocolate pieces. 5) Cover the top of the ice cream with a piece of wax paper, and press it down. 6) Freeze for at least 5-6 hours. 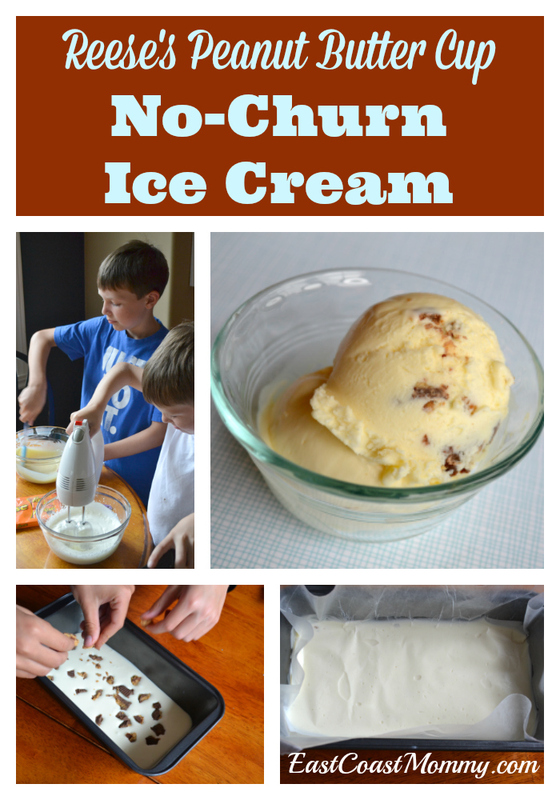 My boys had a wonderful time making this ice cream, and they loved the ice cream's rich and creamy flavour! Have you ever made ice cream this way? Making ice cream from cream and sweetened condensed milk was much easier than I thought it would be, and there was no special equipment required. The boys have already requested another batch. If you give this recipe a try, let me know how it turns out. 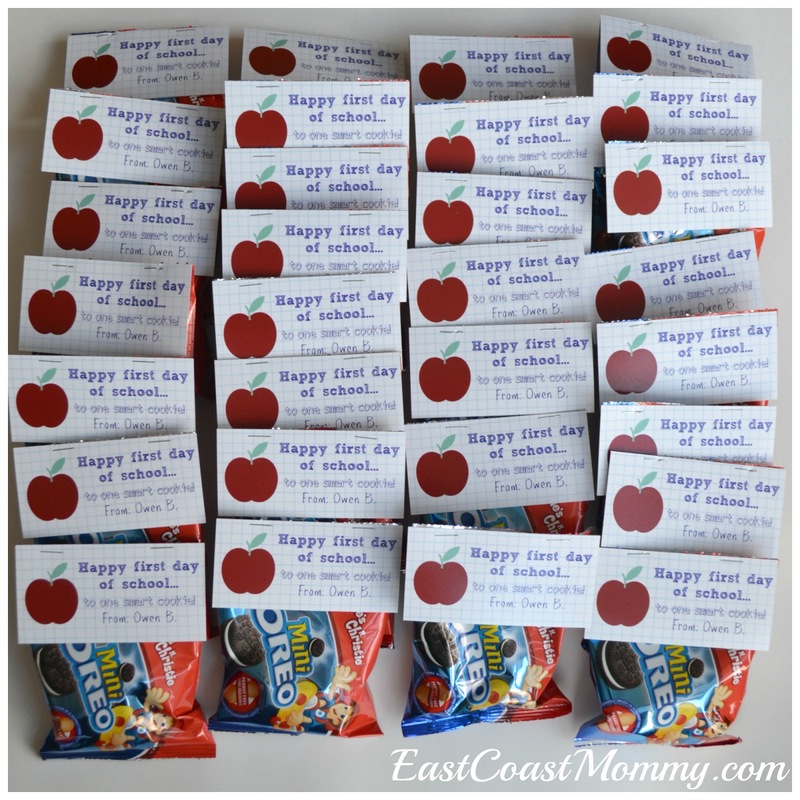 The first day of school is always a stressful time for teachers, so I always like to send little "teacher gifts" with my boys. I want my boys to understand that teachers are important and should be respected. 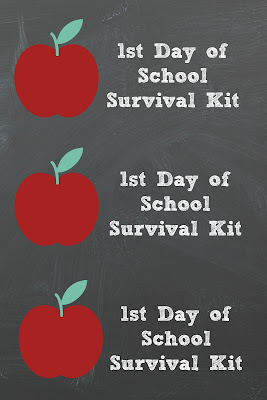 I think bringing a small gift on the first day helps to reinforce this lesson and sets a nice tone for the new school year. 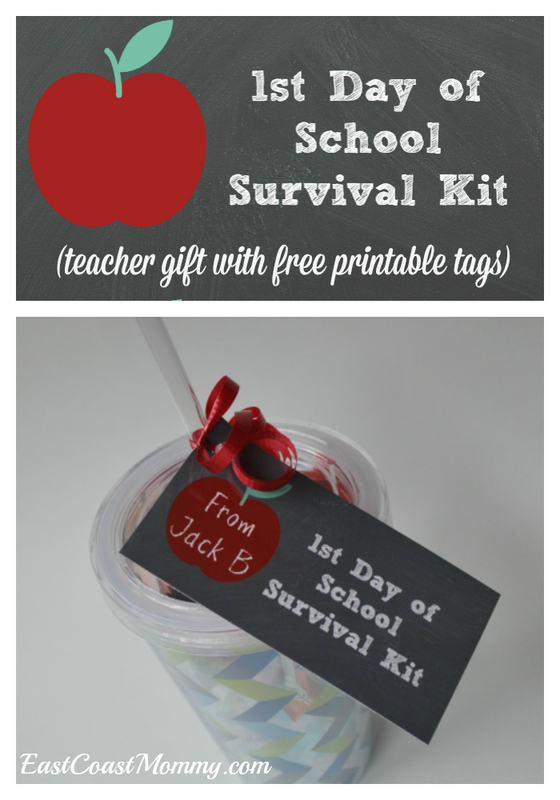 Today, I am sharing the cute "1st day of school survival kit" my boys will be giving to their teachers this year, and I am including the adorable tags I designed that you can download for free. I started with an insulated drinking glass, and I filled it with a few things the teacher might need on the first day. 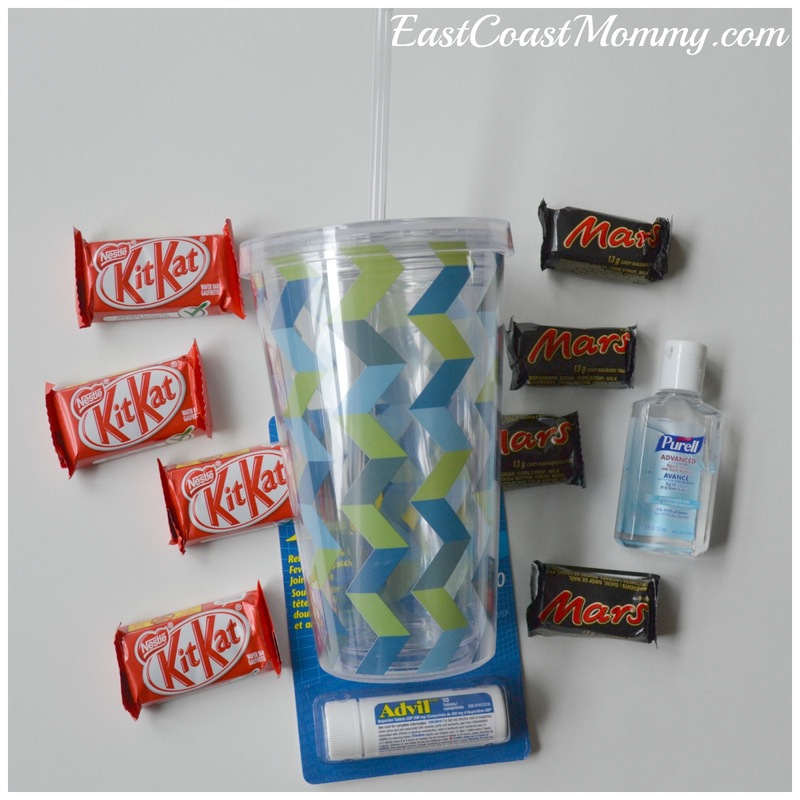 My cups included: chocolate bars, hand sanitizer, and headache medication (which was a bit of a joke, but could actually be quite useful). Then, I added a cute little tag. To download and print the tags for free: right-click on the picture below, save it to your computer, and print it like a regular 4X6 photo. Isn't this a cute (and useful) teacher gift? 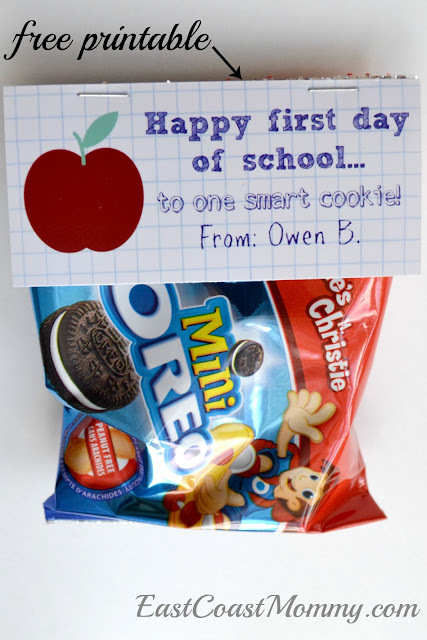 Does your little one like to bring a gift for their teacher on the first day of school? 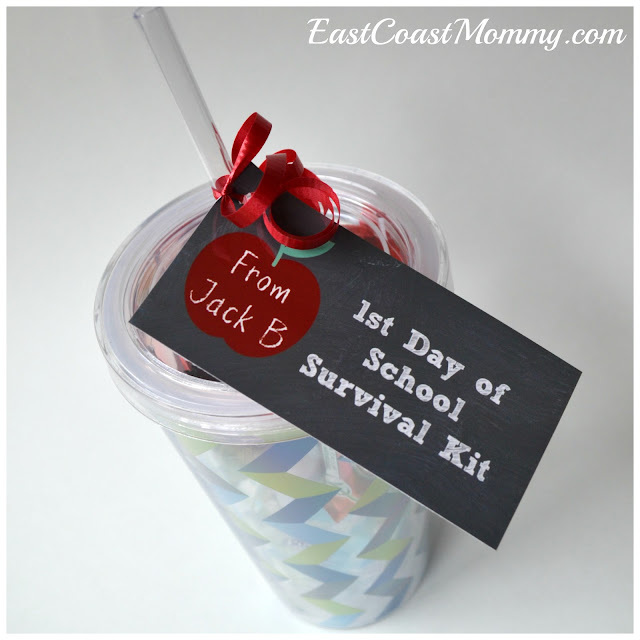 This "1st day of school survival kit" is a wonderful and inexpensive option that is sure to please! I teach a weekly craft class to Preschoolers, and we always make cute crafts related to a fun theme. 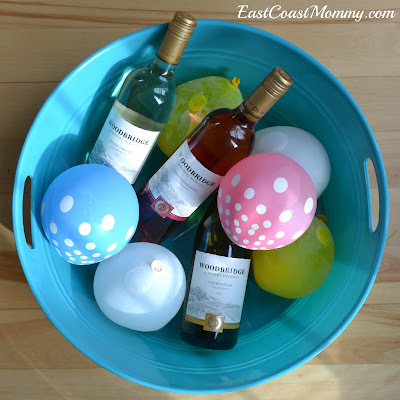 Today, I am sharing some simple "Under the Sea" crafts that are totally adorable! 1) Have the children decorate a paper bag. 2) Stuff the bag with tissue paper. 3) Use a piece of twine to close the bag and create a tail. 4) Use glue to add googly eyes. 1) Cut a mouth from the plate and attach it as a tail. 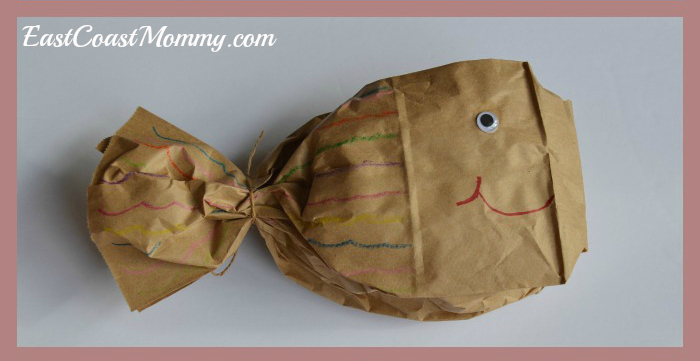 2) Use glue and 1-inch squares of tissue paper to cover the fish. 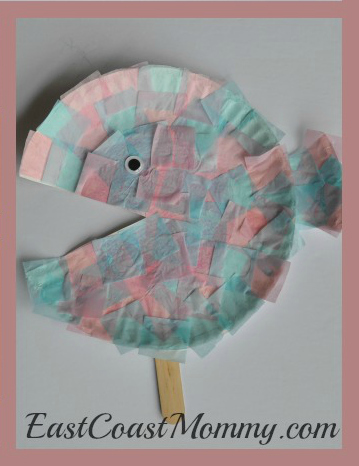 3) Use tape to attach a popsicle stick to the back of the fish. 4) Use glue to attach a googly eye. 1) Cut a circle from a piece of yellow construction paper, and glue it onto a blue sheet of construction paper. 2) Use stickers to create legs. 4) Attach googly eyes with glue. 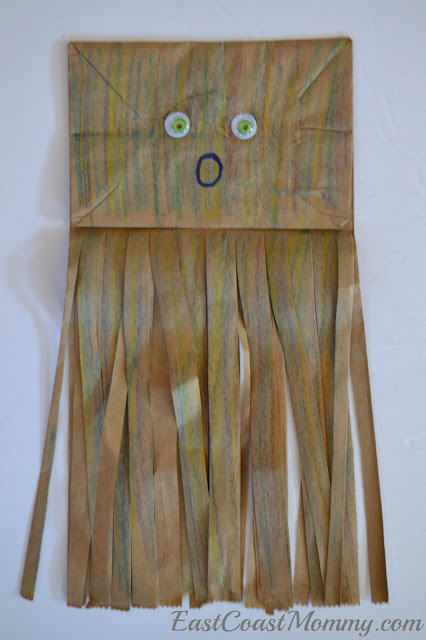 I also love this paper bag jellyfish craft. It's perfect for practicing scissor skills. Color the bag, Cut strips, add googly eyes, and tape a popsicle stick to the back. And how cute is this "scuba diver" craft? 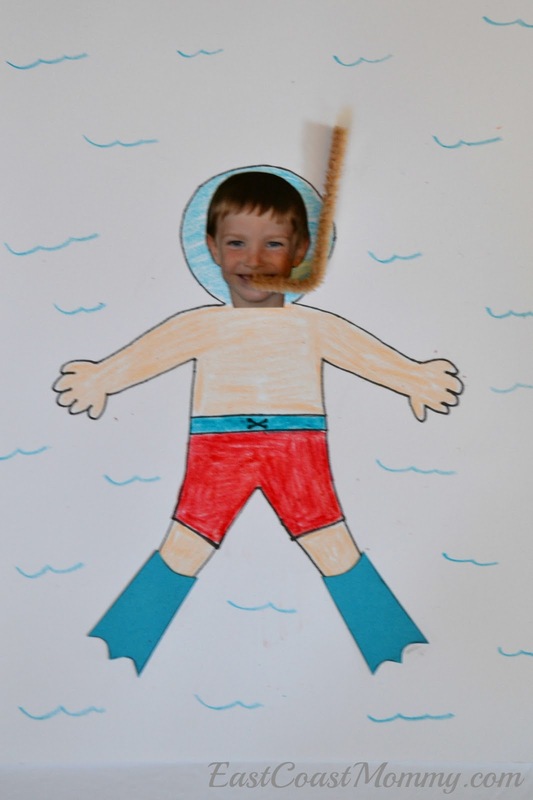 Kids colour the picture, and then they glue on: their face, flippers, and a pipe cleaner snorkel. There are many ideas for an "under the sea" theme, but I think these three crafts are fantastic. 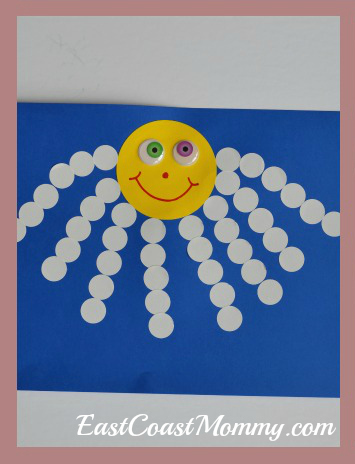 They are really cute, and they are wonderful crafts for practicing fine motor skills. 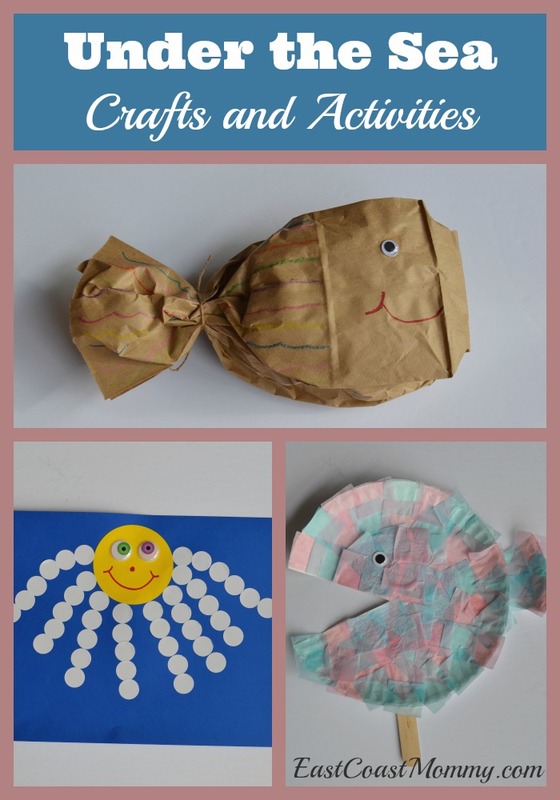 Do you have a little one that would enjoy these "under the sea" crafts? Do your kids love camping as much as mine do? It's a wonderful way for families to spend time together and enjoy the great outdoors. 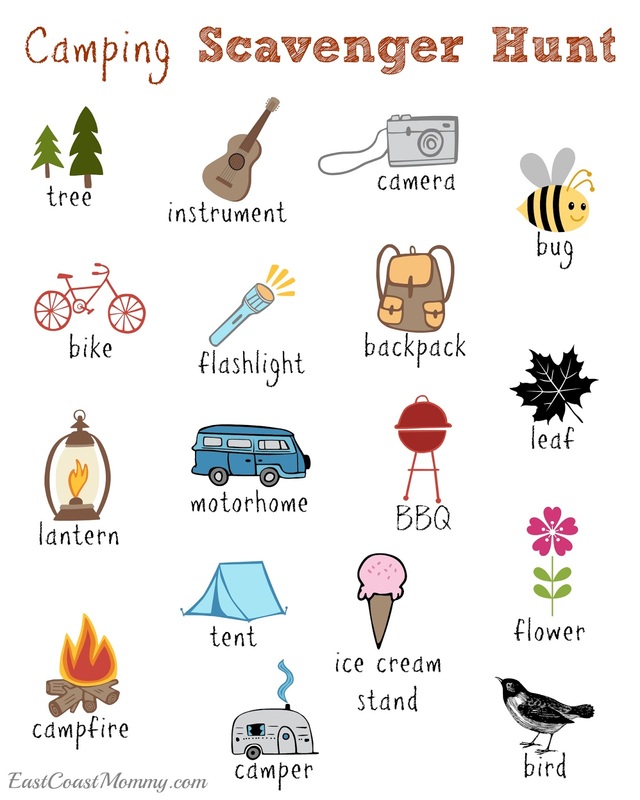 Today, I am sharing a simple camping scavenger hunt that you can print for FREE and take on your next camping adventure. The pictures are adorable, and they make it easy for children of all ages to participate. To print the scavenger hunt: right-click on the picture (above), save it to your computer, and print it like a regular 8X10 photo. Cute, right? 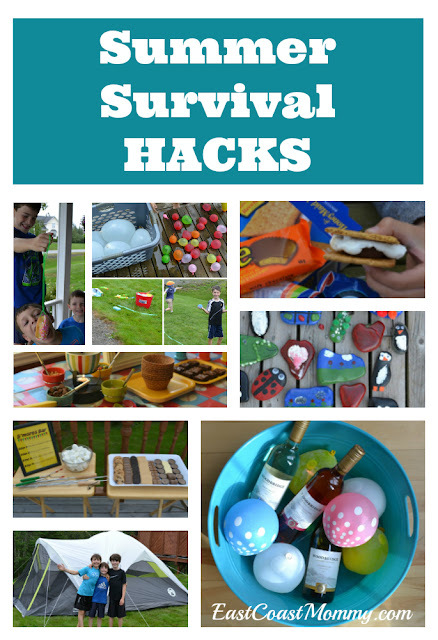 If you try this camping scavenger hunt with your little ones, I'd love to hear about it. Have fun! I've always loved music, and I have been a huge fan of The Beatles since I was a child. I have many memories of listening to Beatles' albums with my Dad as he explained the evolution of their music and the huge impact it had on so many other artists. Now, I am the mom of a new generation of Beatles fans, and together, we are celebrating the new Beatles inspired "Beat Bugs" on Netflix. Check out my boys' cover of the show's theme song All You Need is Love. Seriously... how cute are my boys? With the new Netflix original series Beat Bugs, my family is singing along to classics such as Lucy in the Sky with Diamonds, Help, Blackbird, and All You Need is Love. 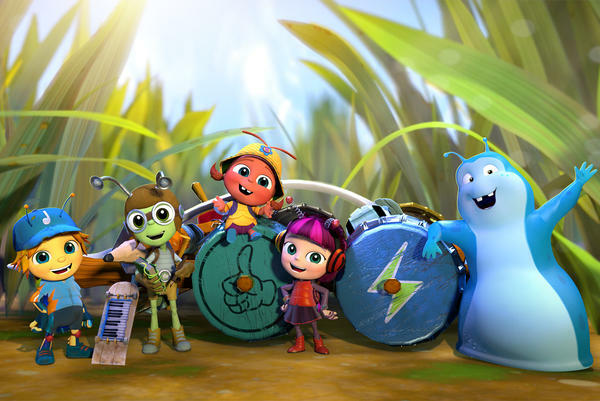 The Beat Bugs (five charming and energetic bug-like creatures) are totally adorable, and the show is full of kid-friendly story-lines and Beatles music re-recorded by today's top artists, including Pink, Sia and Eddie Vedder. 3) I'll select a winner the morning of Wednesday, August 17, 2016. Note: This subscription is for Netflix Canada, so the contest is open to Canadians only. I hope you watch this great new show with your kids, and I can't wait to see your videos! 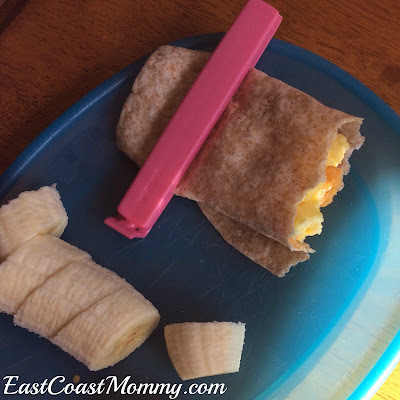 Summer is fantastic, but sometimes busy moms (and dads) need a little help. Today, I am sharing a few summer survival HACKS that you are going to love! You'll never hear "I'm bored" again. 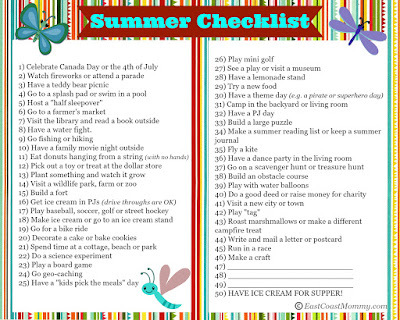 With this summer checklist (that you can print for FREE here), there will always be a new adventure waiting around the corner. 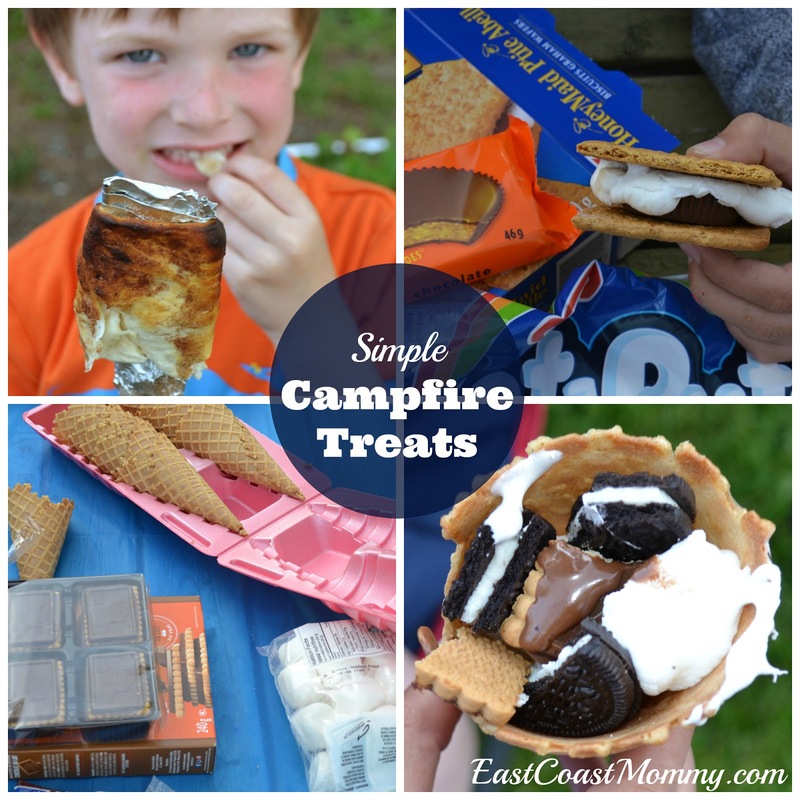 Keep "little campers" happy and full with a variety of fun campfire snacks and a simple s'more bar. 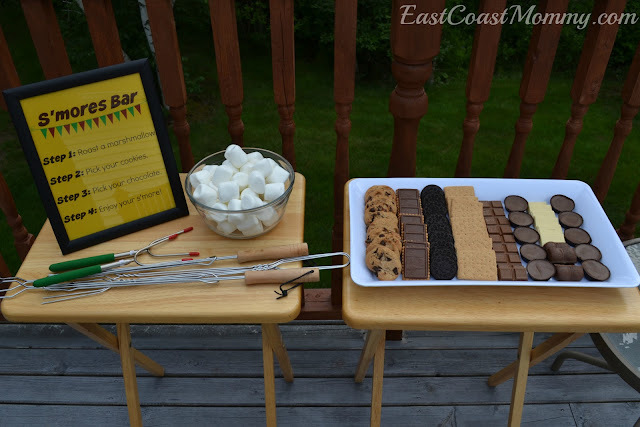 You can download the FREE s'mores bar sign I designed here. Don't forget the wipes for sticky fingers. Baby wipes are a summer staple at my house, and my boys have been out of diapers for many years! What's summer without a special ice cream treat? 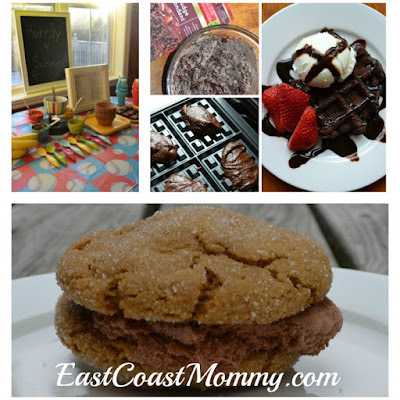 Check out some of my favorite simple and delicious ice cream creations here. 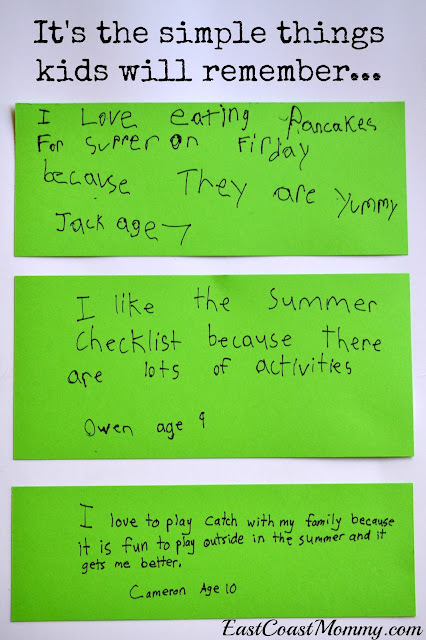 It's always helpful for parents to have a well stocked craft supply cupboard and a few ideas for simple summer crafts. 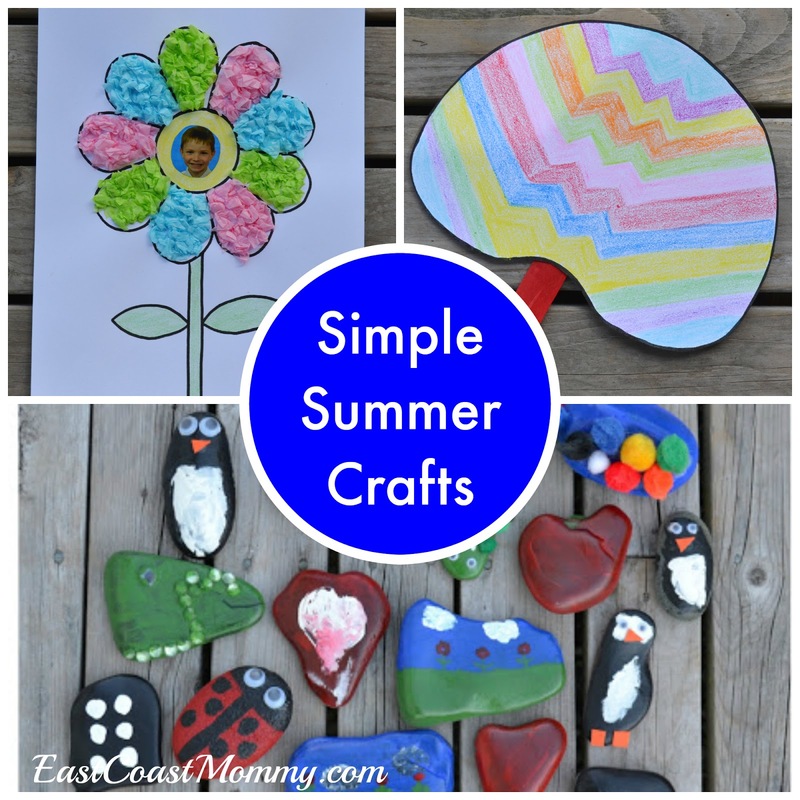 Your little ones will love these simple summer crafts, and you will love the step-by-step instructions and templates. It would be great if the sun shone every day during the summer, but the reality is... there will be rainy days when the kids are stuck inside. 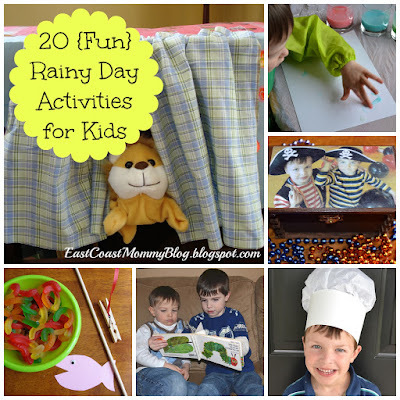 Here are a few sanity savers for rainy days. If the thought of packing up everything and hitting the open road seems overwhelming, opt for a staycation. A backyard camping "trip" is the perfect stress-free summer adventure. 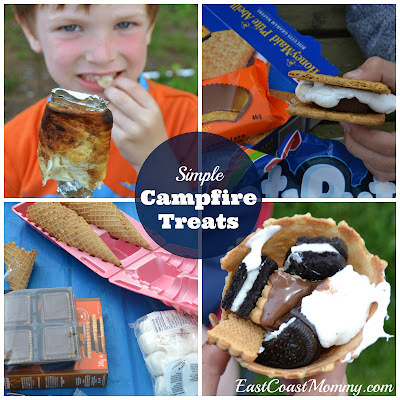 This simple summer survival HACK is a fantastic idea for backyard barbeques and campfires. Fill water balloons and freeze them to create festive (and functional) ice packs. So clever! 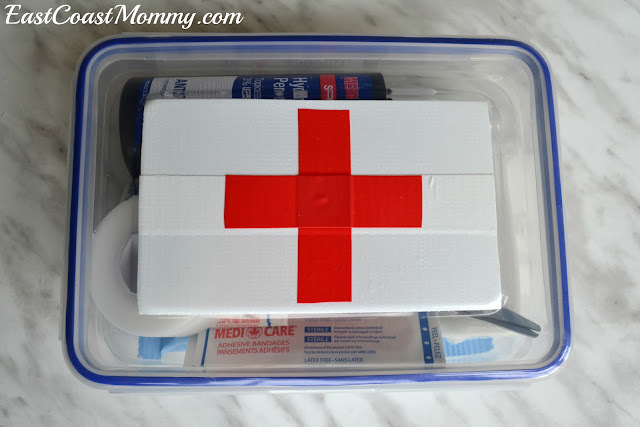 Bumps and bruises are common when kids are running around the neighbourhood in the warm weather, so a fully stocked first aid kit is critical. Check out my "dollar store" version here. 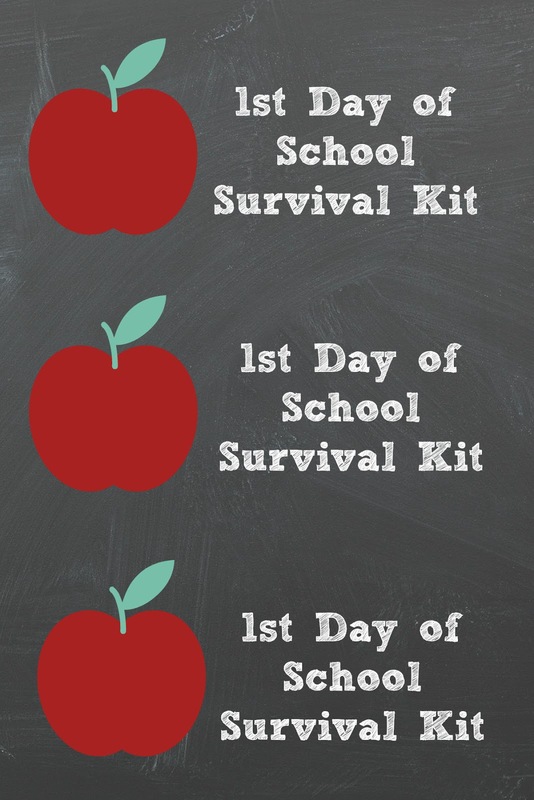 I encourage you try out some of the summer survival HACKS, and I hope you have a fantastic summer! 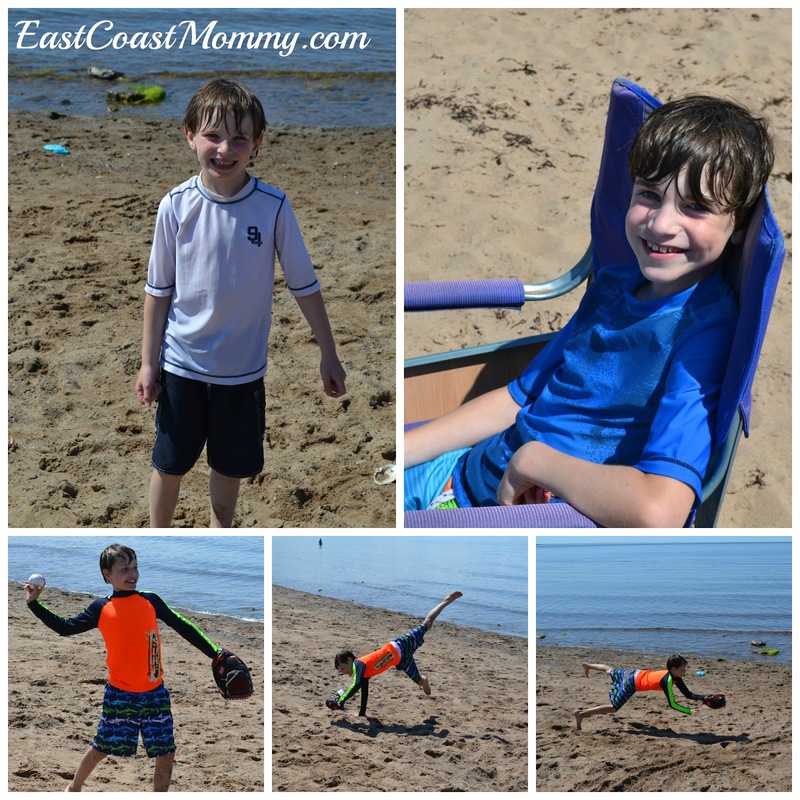 With my boys' busy schedules, I feel like we are constantly on the go during the school year. So, when they are on summer vacation, I try (not always successfully) to slow things down a bit. 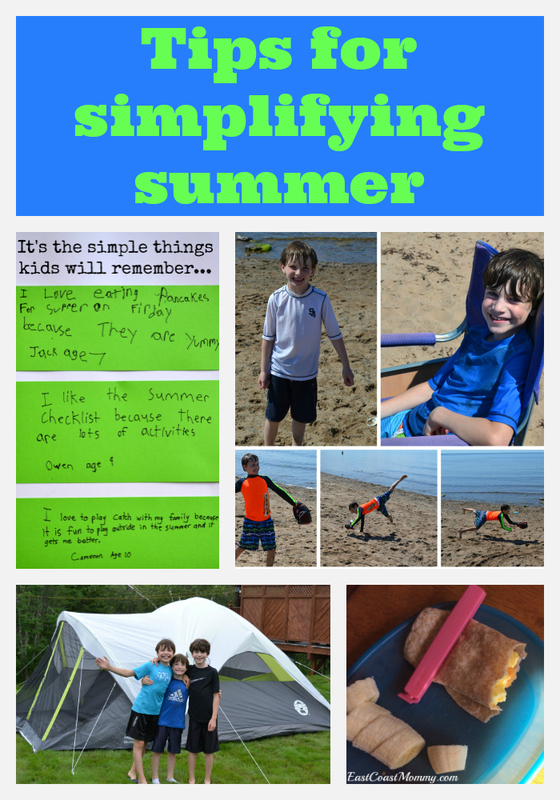 Today, I am sharing 5 ways to simplify summer... and I am letting you know how you can enter to win a $110 prize pack. 1) Make meals easy - Who wants to spend a lot of time in the kitchen during summer months? Scrambled egg wraps, pre-cooked chickens, raw veggies and fruit are summertime favourites in our house. We also love to barbecue. 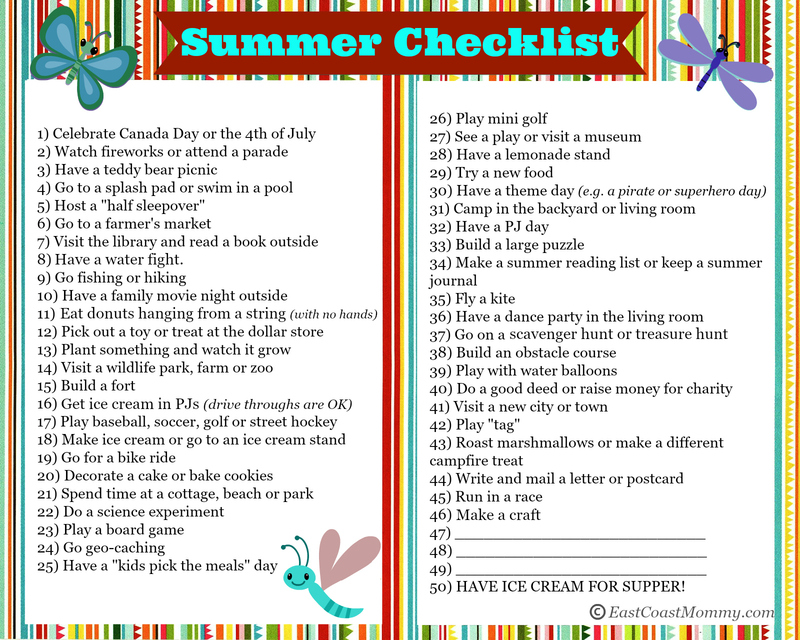 2) Limit organized activities - It's fun to be part of summer sports teams and camps, but I try not to over schedule the kids. There is nothing better than free time in the summer. 3) Opt for a stay-cation - Summer fun doesn't have to be a lot of work or involve travel. Stay-cations (e.g. 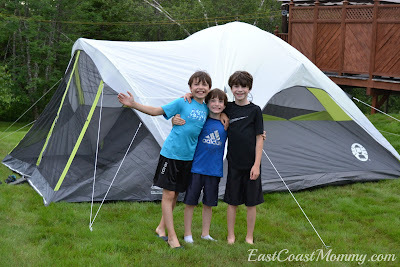 outdoor movies at home and backyard campouts) can be a tremendous amount of fun. 4) Focus on the simple things in life - To help focus on the simple things in life, it is a good idea to take a minute to write down a little thing in life that you appreciate and why it makes you happy. It's also a wonderful exercise to do with kids. I did it with my boys, and it was a good reminder that the simple things in childhood are what kids will remember. 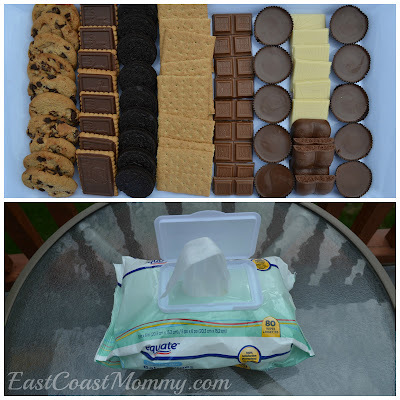 5) Find products that do double duty - Double duty products are wonderful time savers and are perfect for busy parents. 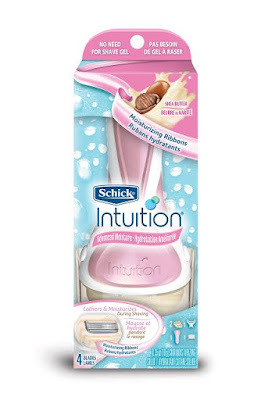 For example, the Schick Intuition Simplicity Curve 3-in-1 razor is great for vacation. You can have a quicker shower in the morning, and you can pack more efficiently because the razor contains shaving lotion AND moisturizer. For a chance to win a Schick Intuition prize pack (valued at $110), share what simplicity means to you. 1) Follow @IntuitionCA on Pinterest and create a board called "Simplicity Curve". 2) Pin your ideas (or a photo of the note you made about the simple thing in life you appreciate and why it makes you happy) using the hashtag #IntuitionSimplicityCurveContest. 3) Copy and paste (up to 3) URL links of your Simplicity Curve Pinned Photos, and enter them at SimplicityCurve.ca. Don't forget you can enter every week. I can't wait to ready about all the simple things in life that you enjoy. Don't forget to simplify your summer, and good luck with the contest!